A recent survey found that only 28% of Americans with between $1 million and $5 million in investable assets consider themselves wealthy. I was incredulous, until I put this in the context of the people that I know and have ministered to over the years. It is a common thing in middle class America for a 65 year old who has worked in midlevel management, been a teacher, nurse, or shop owner, to have accumulated over a million dollars in pension, property, and real assets. As I name individuals in my mind, it does not seem far fetched for three quarters of them not to think of themselves as wealthy. We have become blind to the abundance of our lives. If we cannot see our own state of wealth, we also cannot see our own state of spiritual poverty. I can’t remember the sermon that I heard two weeks ago, even though I remember telling the preacher at the time how excellent it was. Last night I saw in my basement a device that five years ago I paid $200 for and it failed the week after its warranty expired. I remember verbatim the hours of customer service calls that I made. The object has not been pitched, but remains in my basement as a memorial of my hatred for that brand. Yet, I can’t remember a spiritual issue that I have confronted with equal zeal over the last five years. Baal has a way of asserting its priority, while the Lord God wonders why we drift away. Einstein taught us that massive objects, like our sun, have the ability to bend light. Spiritually massive objects, like money, bend the light of God’s love away from our eyes. In a similar way, poverty, loneliness, sickness, and the naked love of the soul, bend our hearts into alignment with the Holy One. What is radical and needs to be remembered in the church, is the way Jesus always spoke about wealth as a mortal danger. 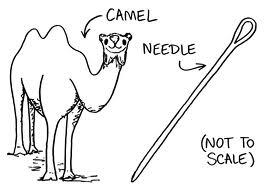 Camels can’t make it through needles to save their souls.